A few more details have emerged in the alleged hammer attack by an UberX driver on a San Francisco man, including information on how the route the driver took might have precipitated the altercation. As previously reported, UberX driver Patrick Karajah allegedly struck passenger Roberto Chicas in the head with a hammer last Tuesday, after the two men argued over Karajah's chosen route. According to a report in today's Chronicle, Chicas, who works as a bartender at The Cavalier, a restaurant near 5th and Mission Streets, says that on the night of the attack, he had gone out for after-work drinks at a nearby bar. He and two friends then summoned an UberX for a ride to Chicas' home in the Lower Haight. Instead, Karajah took Chicas on a bizarre route that ended at Ellsworth Street and Alemany Boulevard, which you can see from the map above (the final stop is marked by the red icon) was nowhere near where they should have been. According to Harry Stern, an attorney who is representing Chicas who spoke with the Chron, the argument over the route began when Karajah took the freeway to reach Chicas' home. As you can see from the map above, that's certainly a route that makes little logical sense, and Chicas said as much to Karajah. Stern says this caused Karajah to become "agitated, stopping twice to try to force them out of the car." At the second stop, at Alemany and Ellsworth, Karajah allegedly kicked out his three passengers, then allegedly hit Chicas in the head with a hammer, leaving him with injuries so severe that he might lose an eye. Though Karajah did not have a criminal record, and therefore wouldn't have been caught in any of the vetting proceses that Uber says they use, Stern says that "this was somebody with a hair trigger who fell through the cracks, someone who is unfit to be dealing with the public." That theory might be bolstered by remarks made by neighbors of Karajah's Pacifica home, who said that police have been there more than once on disturbance calls, and that "there's been some stuff at that house, brothers fighting." A calls made to Karajah’s attorney by SFist had not been returned at publication time. Karajah remains free on $125,000 bail, after pleading not guilty to charges of assault with a deadly weapon and battery with serious bodily injury last Thursday. According to Uber, his driving account with them has been suspended. However, Stern tells Forbes, Uber has yet to refund Chicas' ride. 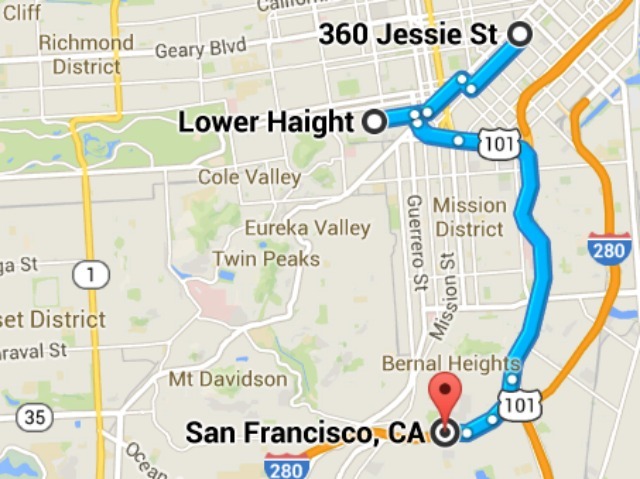 There's SoMa, There's the Lower Haight, and allllll the way down there is Alemany and Ellsworth.